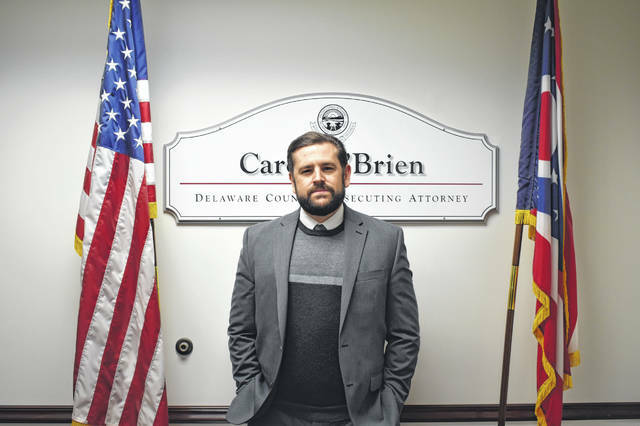 Delaware County Drug Prosecutor Brian Walter is pictured in front of the Delaware County Prosecutor’s Office in Delaware. Wednesday’s drug case indictments were the last ones handled by Delaware County Drug Prosecutor Brian Walter, who departed the office last week. Walter joined the Delaware County Prosecutor’s Office in 2010 and became the county’s first drug prosecutor in 2014. Walter said he prosecuted every felony case involving drugs in Delaware County and handled a variety of cases from possession cases to drug trafficking rings. Walter said Wednesday he is leaving the office after he took a position on the Ohio Board of Nursing. Walter said that over his time at the prosecutor’s office, he’s seen increases in drug cases in the county and seen the impact of the opioids epidemic firsthand. Head of the Delaware County Drug Task Force, Sgt. Randy Pohl, said Wednesday that Walter was a valuable ally to the task force. Walter said there’s several things he’ll miss about the position. Walter said he’s appreciative of Delaware County Prosecutor Carol O’Brien and the community. The prosecutor’s office said Wednesday that a new drug prosecutor has not yet been appointed.